I frequently experiment with various perspectives when trying to be creative with my photography. There are many well-known techniques to use, like “get low,” “get close,” “get closer,” “look behind you,” etc… I enjoy the challenge of seeing things in different ways and find it very gratifying when I capture an image I like. This was taken one day while we were being tourists in Helsinki. Walking through a park, we approached this sculpture. It is a monument honoring the Finnish composer Jean Sibelius and is made up of stylized organ pipes cascading up & down like a wave. I found it interesting, but not necessarily photogenic. Then I noticed some small children playing underneath the pipes. They were running around and having fun, but occasionally one would stop and look up from underneath the monument…and it seemed to hold their attention. I thought to myself, there must be an good view from that position if the kids are stopping to take a look! The children left shortly thereafter and I walked under the monument. I had to crouch in spots, but I could see what the children saw. 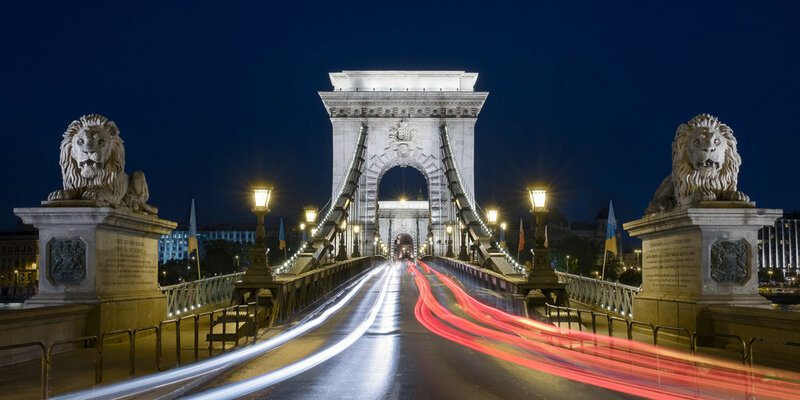 Completed in 1849, the Chain Bridge was the first bridge that connected Buda & Pest and was considered a wonder of the world. It was almost completely destroyed by the retreating German army near the end of World War II, but Hungary decided to rebuild the landmark. Exactly 100 years after its original completion, the bridge re-opened in 1949. There is a myth involving the lions guarding each side of the bridge. Shortly after their placement in 1852, word spread that the sculptor, János Marschalkó, forgot to provide tongues to the open-mouthed lions. Embarrassed and ashamed of his mistake, Marschalkó supposedly then took his own life by being the first person to jump off of the bridge. His suicide, however, is only a legend as Marschalkó died from old age many years later. Apparently though, he was very frustrated by the the critical rumors of his mistake. To prove that his sculptures were correct, he took several people from Budapest to a circus. It is reported that upon seeing a real lion, he was finally able to prove to his doubters that you not see a lion's tongue when it opens its mouth. What I found interesting about this story, is that I could not find proof that the sculptures actually do have tongues! It is reported on several websites that the lions, in fact, do have tongues. However, you cannot see the tongues unless you climb up on the sculptures...which I did not do. Rather than climb the sculptures, I chose to position myself on a small, raised triangular section of concrete in the middle of the road and take a photograph. I wouldn't call it a sidewalk, but it did separate the two lanes of the road and, while it sounds dangerous, it provided a safe place to stand as cars passed on both sides. My intention was to get an image featuring the light trails of the cars passing by. After I arrived home and reviewed my images, I found I preferred the cleaner image above of just the bridge itself. That said, I decided to also share the other version (and my original intention) below. Clicking on either one will give you a larger image from my website. I would love to know which one you prefer! 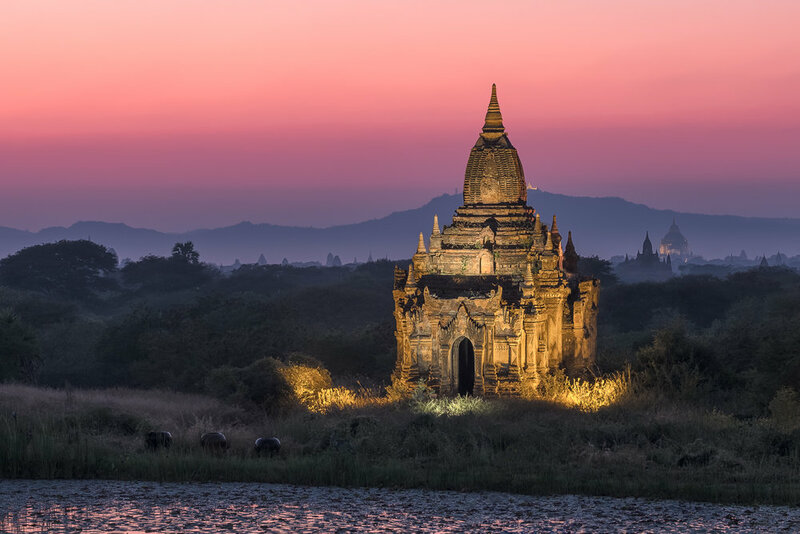 Most tourists in Bagan spend their days visiting the largest temples…walking around the impressive structures and exploring the insides of those open to the public. As amazing as it is to experience these temples up close, it pales in comparison to finding a spot where you can look out over the entire valley and appreciate the sheer number of them. If you happen to get a colorful sky at sunset or sunrise, the experience can be magical. We were facing the sun, and the light was harsh. Surprisingly, we started to see a glow developing in the haze in the distance...not high in the sky, but below the sun and just above the ground. I planned on a wide angle photo of the valley, but I quickly grabbed my longest telephoto lens to zoom in on the silhouetted skyline. The light was intense, but dropping the exposure setting to -2 protected the highlights and still left some of the detail in the foreground. The glow lasted for about 10 minutes until the sun fell behind the mountain in the distance. This is the first photo I took in Bagan and I ended up taking several hundred more as the light softened. I encourage you to also check out a previous post, Peaceful Paya, to see how the warm golden glow was replaced with cooler pink hues high in the sky on the same evening. Even without clouds, I found this sunset to be spectacular. Perhaps we were just lucky, but since watching the sunset is heavily promoted as a must-do when visiting, I suspect sunsets frequently surprise in Bagan. One of the first things I did upon arriving in Naples was walk down the bustling Via Toledo and descend into the Toledo metro station. Numerous websites and publications proclaim this station as one of the most beautiful in Europe, so I had to see it for myself. It was 8pm on a Saturday night and it was filled with locals & tourists going to/from the nearby bars, shops and restaurants. People were everywhere as I wandered down escalators, stairways and passageways looking for possible places to photograph. The architecture was interesting, but the scene was chaotic. I decided to wait and return when the station would be less crowded. The next morning I returned at 6:00 am and was one of the first people through the doors. It felt completely different without the crowds. I could more easily appreciate all of the details in the architecture that were often masked by all of the moving bodies the previous day. This area was my favorite. As you descend on the escalator, you become surrounded by colorful tiles and waves reaching out of the walls…it feels like you are submerging into an underwater cave. Since there was no one there, I was able to take some time to capture images at the bottom. 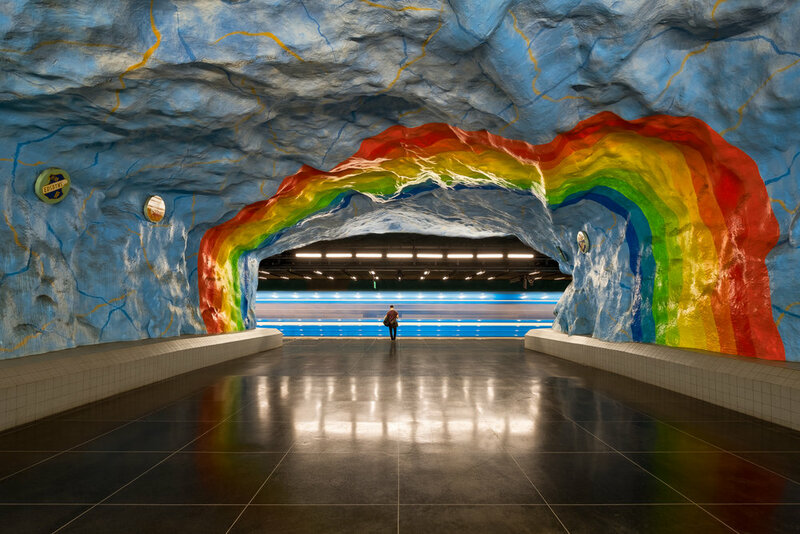 I definitely find it to be a unique and beautiful subway station. This is Cathedral Rock in Sedona, Arizona…one of of the many photogenic rock formations that populate the desert landscape here. Due to the numerous trails that go up and around Cathedral Rock, you can appreciate it from almost every angle. The most popular trail is on the East side of the formation, as it allows you to hike up and look through the middle gap. I found this spot while exploring less frequented trails on the Western side, looking for a place to photograph sunset. 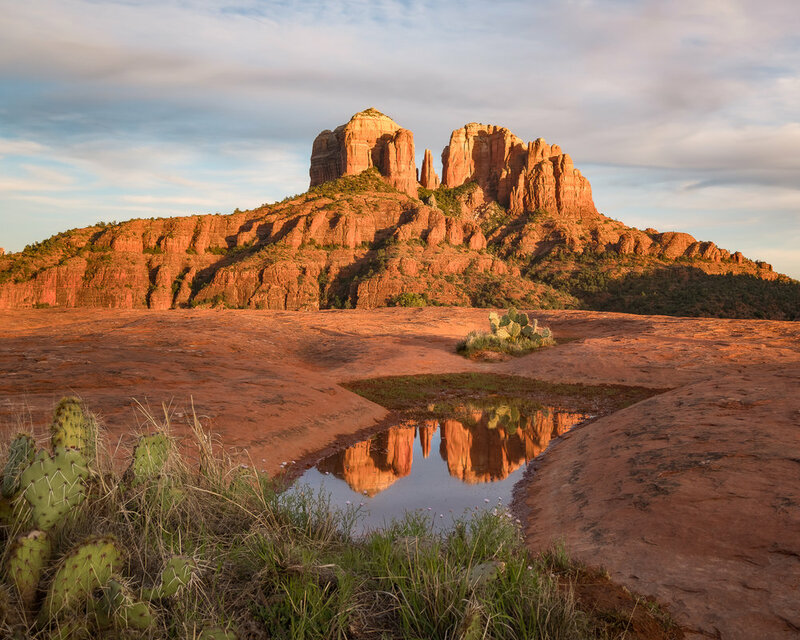 If you are not familiar with Sedona, you may be surprised to learn that the best sunset views are actually facing East, not West! The rocks have a tendency to glow red and orange from the soft light just before the sun disappears. I was surprised to find this pool of water on an area of exposed rock. It hadn’t rained in over a week, but somehow, perhaps from a natural spring, a shallow pool existed in this arid climate. It provided a great reflection of the peaks as the sun went down behind me. 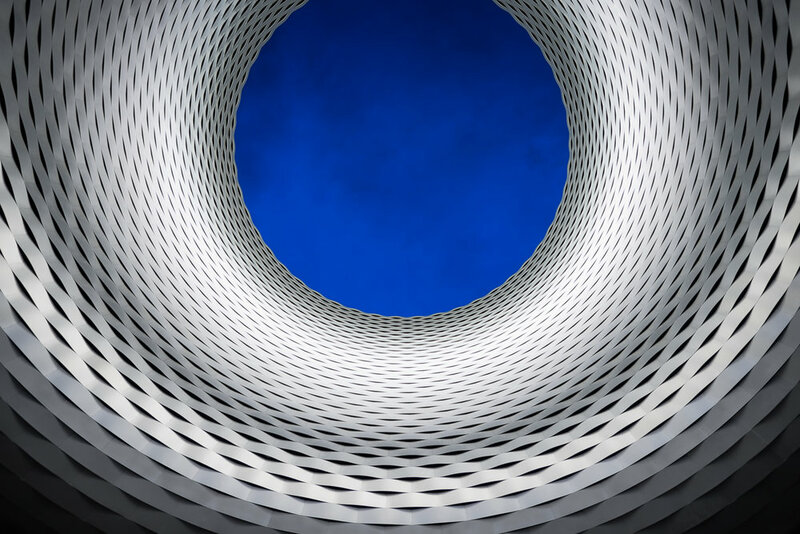 In my opinion, the architecture around Messeplatz is some of the best in Basel. The facade of the main building features a repeating ribbon-like metal pattern on many of its surfaces. This covered passage between convention halls is a great example. I suspect this is one of the most photographed places in the city, as I always see several people taking pictures when I am here. The challenge, I find, is to try and eliminate all of the distractions. The square is often filled with people, trams, street vendors, neon lights and/or seasonal festivals, rides and exhibitions. All this activity can create a challenge to capture the type of clean image that I prefer. My solution (which I have used many times) was to focus on what was above. This perspective eliminates all the distractions and buzzing activity at eye level, leaving only simple shapes & patterns. I took this in the evening when the sides of the opening were illuminated from lights below. The deep blues of the sky and clouds above provided great tonal and color contrast to the monochrome building. I particularly liked this point of view…it felt like an enormous, futuristic eye was spying on me from above…eye spy. 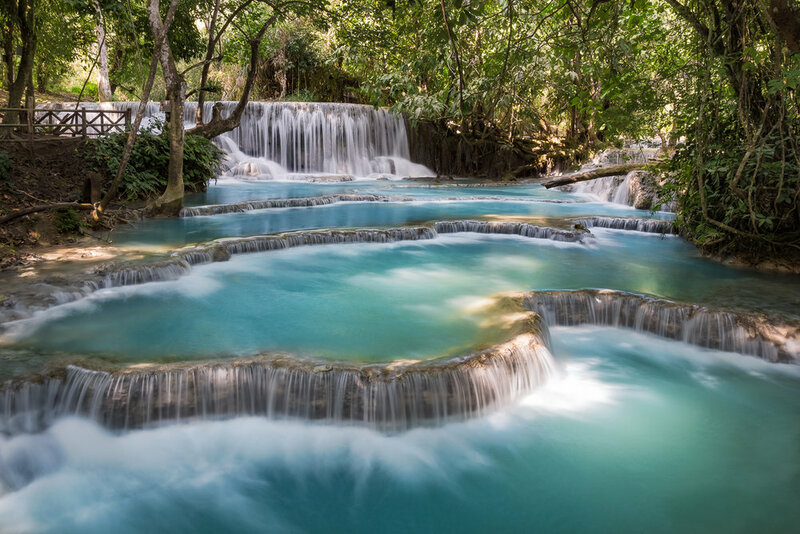 These are part of the beautiful Kuang Si waterfalls outside of Luang Prabang. It is only a short hike from the entrance of the falls to get to this point. Here, several layers cascade gently downward in vibrant turquoise pools creating a striking scene. I spent several minutes here photographing the falls and just watching the water flow past...the color was captivating. Visting Bagan, Myanmar in December 2017 was an incredible experience. The plains near the ancient city are filled with over 2,200 Buddhist monuments (pagodas, stupas, monasteries, etc) of varying shapes and sizes. Between the 9th & 13th centuries, Bagan was the flourishing capital of the Pagan Kingdom and over 10,000 monuments were built here. Sadly, after repeated Mongol invasions and numerous earthquakes, only a fraction of the monuments survived. Still, with over 2,000 remaining, a view across the plains is a mesmerizing sight. This was taken on our first night in Bagan. We arrived only an hour before sunset and did not have time to venture out into the plains. Fortunately, there was this beautiful small pagoda (Paya, in Burmese) very close to our hotel. From this spot, you could see numerous temples in the background and it turned out to be a great place to watch the sunset. As the sun disappeared behind the mountain in the distance, the sky softened and the lights around the pagoda illuminated. A perfect, peaceful first night in Bagan. San Gimignano is one of my favorite hill towns in Italy. It’s skyline of towers built in the 1200’s is both unique and impressive. San Gimignano prospered as a key trading town in the early thirteenth century and well off families would build a tower as a show of their wealth. At one point, over 70 towers dominated the town. 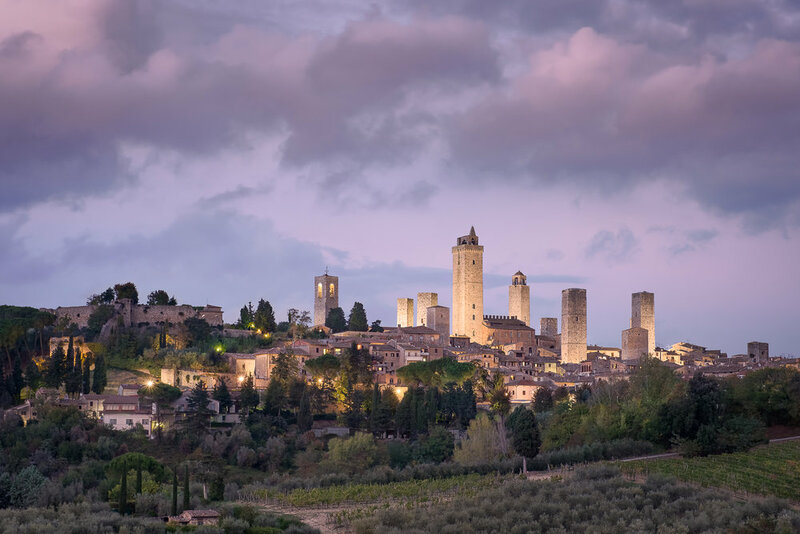 Today, 13 towers remain and San Gimignano is a UNESCO World Heritage Site, commonly referred to as “Medieval Manhattan"
I highly recommend anyone visiting nearby Florence to take a day-trip here. Get here early in the day though, as tourist buses start arriving mid-morning and the town can be overrun with people in the summer. In the off-season, the town is quiet and peaceful. I took this image a couple of weeks ago in early October and there were only a handful of other tourists. As the sun went down and the lights illuminated the towers, it was a magical scene. 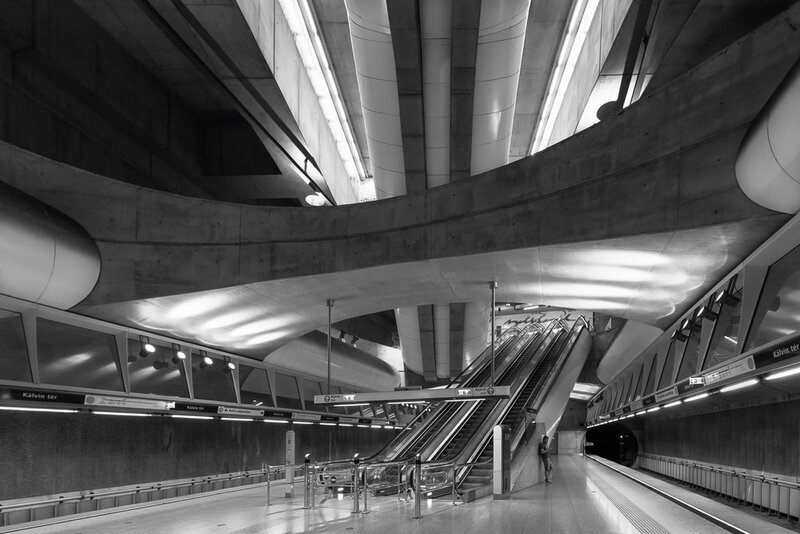 This is another modern metro station that I found interesting (maybe even a bit dizzying) in Budapest. The combination of colors, swirls and curves kept my eyes going around in circles as I walked from the escalators over to this spot at the far end of the platform. I sat here on a bench for several minutes appreciating the detail of the ceiling tiles. I suspect the workers who had to place all of these tiles in this specific pattern were very patient people…and probably very good at jigsaw puzzles. Fortunately, the metro was not very busy at this time of night, so I did not have to wait long for the station to clear out. Since the security guards will not let you set up a tripod, I was forced to take this hand-held. I have to admit, it took me several attempts to align the camera to get the symmetry as perfect as possible. Looking through the viewfinder, the swirls kept playing tricks with my perception. Persistence eventually paid off though and I was happy to capture this image with the Tripod Police hidden behind one of the far columns. The Hungarian Parliament Building in Budapest is spectacular. I spent a lot of time walking around it and admiring it from every angle. Up close you can get lost in the fine details, while farther away the towers, dome and symmetry dominate. This is my favorite view of Parliament, standing in Buda and looking at it from across the Danube river. When the lights come on in the evening, they give the building even more character…adding depth and shadows that bring out even more details. The river traffic was congested and I was surprised at how long I had to wait for an opening where no boats were in view. Eventually, an opening appeared though and I was able to take some 3-5 second exposures to soften the ripples in the water so that the only sharp details were of the building. The following evening I decided to watch the building light up from the Pest side of the river. I thought some of you may be interested to see what the other side of the building looks like, so I included an image below. Being much closer to the building, the dome and towers visible in the other image are mostly obscured from view. Even with my wide angle lens it was difficult to fit the entire building in a single shot…the building is massive. I did find this spot interesting though, as they have installed a small reflecting pool that provided a nice foreground. A very impressive architectural feat from every angle and definitely a highlight of any trip to Budapest. Since it was 98 degrees outside, I decided to spend some time exploring the underground in Budapest. The city recently added a new metro line to its network and some of the modern stations are fantastic. 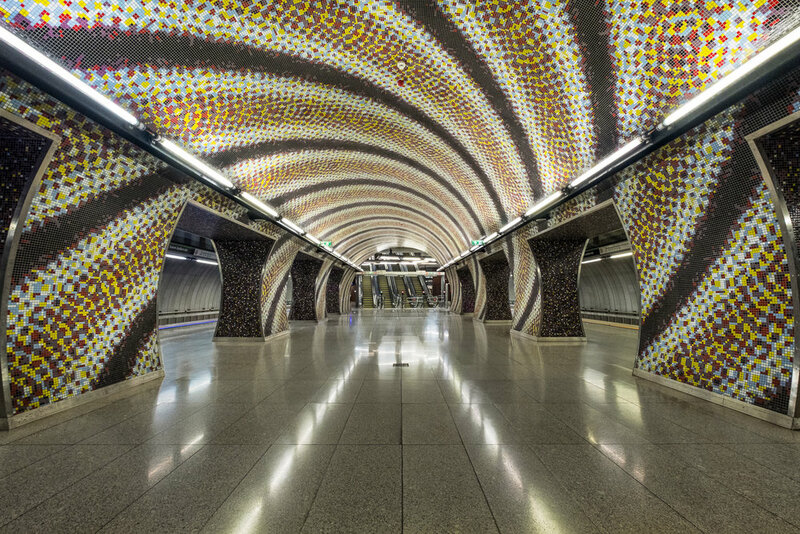 This station, Kálvin tér, is one of my favorites. I particularly liked this point of view, looking up from the platform. It is a deep station and requires taking three different sets of escalators to reach the bottom. These escalators criss-cross and their lines along with the other curves and patterns create an interesting perspective. Perhaps the only thing missing from this station is color. It is mostly concrete and varying shades of gray. Well suited for a monochromatic image. This is the view you get when you climb the stairs up to the top of the Buda Castle in Budapest. I found this spot to be a beautiful place to gaze over the city and spent several hours here doing just that. I arrived in the late afternoon, hoping to photograph this view with an amazing sunset, but it was not to be. The sky was clear and the sun simply disappeared without providing any color. I knew, however, that there would be another photo opportunity as the city transitioned into night. As the sky darkened, the lights slowly took turns illuminating their subjects. 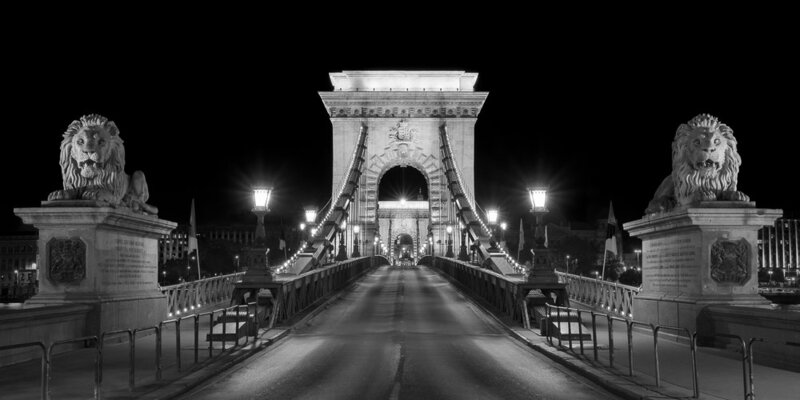 First the Chain Bridge, then the river promenade, followed by St. Stevens Cathedral and finally the Parliament building. It was a much more interesting & colorful show than the sunset. Budapest is more beautiful than I expected. This was one of the first images I captured here and I look forward to sharing several more images from my visit in future weeks. In late June/early July, I had the pleasure of returning to Iceland and exploring many new places that I had not visited before. However, there were several spots where I could not pass up the opportunity to return for a second or third time. This mountain, Kirkjufell, and its nearby waterfalls had a profound impact on me the first time I went to Iceland. Kirkjufell, translated from Icelandic means Church Mountain and I was excited to go back to Church! At this time of year, the sun does not set until after midnight and rises again before 3 am. It is a strange feeling to be walking around Iceland at 2 am in light that is bright enough to read a book. While the lack of darkness plays tricks with your mind, the sunsets and sunrises last almost an hour instead of just minutes. This was fantastic as I was able to move around and capture several compositions during the same sunset! Kirkjufell and its waterfalls are one of the most popular destinations in West Iceland and, as expected, I arrived to find a crowd of tourists and photographers swarming all over the waterfalls. It was 10pm though, still 2 hours before sunset, so I expected the crowds to disperse as time passed. I noticed the sky had some real potential and some golden hues were already starting to show. I joined the crowd for a short time, but soon found myself wandering further away from the main waterfalls, looking for something different. When I found this small pool of water reflecting the sky and the mountain top, I settled in and waited for my first sunset after midnight. I did not have to wait very long. Around 11pm, the golden hues were replaced with red, pink and magenta as the various layers of Icelandic clouds captured the light in different ways. A heavenly show above Church Mountain. Shortly after taking this I made my way back to the waterfalls for other compositions. I will share those images with you in future posts. The crowds disappeared after midnight and so did the color in the sky. However, light remained and I had the falls and the mountain to myself, so I stayed…enjoying the peacefulness of being alone in this place, alone at Kirkjufell. Aldeyjarfoss in the central highlands is one of my favorite waterfalls in Iceland (or anywhere for that matter). It is fairly remote, located more than an hour’s drive from the main Ring Road and requires a 4x4 to access. There is no lodging nearby, so photographing the falls at sunrise requires camping or a very early wakeup call. I decided to camp (sort of) and rented an SUV with a tent on the top. Yes, on the top…it opened like a clam shell and you used a ladder to access it. Cool idea, right? I thought so. The first night I arrived here, the weather was calm. I popped the tent and slept like a baby. Unfortunately, the calm, clear weather provided some of most boring skies I have seen in Iceland. They were colorless too, both at sunset and sunrise. While Aldeyjarfoss was impressive to witness firsthand, my photographs were rather blah. As a result, I decided to drive back to the Ring Road to visit some other locations and return again that night for a second attempt. On the second night, I arrived a couple hours before sunset. The clouds were coming in and my hopes for a good photograph were rising. Then, as it often does in Iceland, the weather dramatically changed. Rain started coming down sideways, the wind howled and everything turned gray (if you could see anything at all). I managed to open the tent, get in and attempt to sleep. The wind shook the SUV so much that I was rolling around on top of it, and before long the rain started making its way inside. I decided to abandon tent… Opening the zipper, I caught a face full of rain and discovered that the wind had blown the ladder away! My tent exit/rooftop dismount was basically a wet slide/flop, but I landed on my feet! I found the ladder, closed the tent and climbed in the back of the SUV. Of course, I got completely soaked in this hilarious process. Sedona was just one of many places that amazed me during my trip to Arizona and Utah. The red rock formations here dominate the landscape in every direction. Some are more impressive than others, but all are beautiful. Perhaps the most famous of these formations is Cathedral Rock (on the right side of the photo). It was my first stop after arriving in Sedona and I spent hours wandering around the trails and parks on its Western side. As sunset approached, I was in a position where Courthouse Butte was also visible, several miles in the distance and to the left of Cathedral Rock. Sedona is famous for its colorful sunsets, so I decided to wait here and hope for some great light. Needless to say, this sunset did not disappoint. I always enjoy the experience of seeing the sun disappear below the horizon. In Sedona, however, the main performance is in the opposite direction...watching the formations transform into vibrant towers. The red rocks come alive with color and even begin to glow as they reflect the warm sunlight. Unfortunately, the show only lasts for 10-15 minutes and leaves you wanting for more. Fortunately, the rocks regularly reprise their role the following evening. I finally got a chance to catch my breath on my trip through the Southwest U.S. and wanted to share a recent image with you. This is Horseshoe Bend near Page, Arizona. It is probably one of the most photographed places in the Southwest United States…and for good reason. This bend in the Colorado River is truly a spectacle to see in person. If you have the nerve, you can walk right up to the edge and peer over the steep cliffs to view the river, 1,000 feet below. I came to this spot a few times during my trip. The first couple of times, the weather was poor…so I did not get the image I was hoping for. However, on the third attempt, I was rewarded with one of the most colorful sunsets I have ever experienced. As the sun disappeared, it lit up the clouds with an intense red glow that reflected down to everything below. There were probably a hundred or more people near me at this lookout point. Numerous audible “oohs” and “aahs” were heard as everyone watched this unfold. It seemed that every time I thought I had seen the best part of the sunset, it actually got better! I took hundreds of photos…some before the color started, some with the signature “sun flare” as the sun descended below the land in the distance, and many more as the clouds caught fire. I hope to share some of those other images in future posts. Unfortunately, the show had to end, but wow, what a performance! They say timing is everything. I am not sure who “they” are, but I tend to agree…especially in the case of this image. After spending an hour photographing sunset at Wat Chedi Luang, my wife and I started making our way out of the complex, past this beautiful temple and toward the center of Chiang Mai. I quickly moved to a position in-between the crowds and the temple. Seemingly oblivious to the mild chaos behind her, this solitary figure kneeled in prayer. It was her beautiful red clothing that first caught my attention, then her pose and concentration. In front of her the golden Buddha was illuminated by the nearby lights and, fortunately timed, the blue hour had begun. What a beautiful scene! From observation to capture, this image took no more than twenty seconds. A scramble into position, a quick change of camera settings and a silent prayer of my own as I released the shutter.